Twitter friends: what papers or frameworks do you recommend regarding distributed systems regression or integration testing techniques? In spite of unit testing being a standard practice everywhere, things don’t seem to have gotten any better for testing distributed systems end-to-end. From my viewpoint atop the ivory tower, the state-of-the-art in testing distributed systems doesn’t seem quite as disappointing as Crista’s blog post might lead you to believe. As I am now wrapping up my dissertation on testing and debugging distributed systems, I feel compelled to share some of what I’ve learned about testing over the last five years. Crista points out that there are several existing surveys of testing techniques for distributed systems, e.g. Inés Sombra’s RICON 2014 talk or Caitie McCaffrey’s CACM article. Here, I’ll structure the discussion around the challenges posed by different testing goals, and the tradeoffs different testing technologies make in overcoming those challenges. I’ll mostly cover end-to-end techniques (per Crista’s original question), and I’ll focus on academic research rather than best practices. We’re given: (i) a safety condition (assertion) that the system has violated in the past, and (ii) the environmental conditions (e.g. system configuration) that caused the system to violate the safety condition. Our goal: we want to produce an oracle (automated test case) that will notify us whenever the old bug resurfaces as we make new changes to the codebase. a) Non-determinism: we’d like our regression test to reliably reproduce the bug whenever it resurfaces. Yet distributed systems depend on two major sources of non-determinism: the order of messages delivered by the network, and clocks (e.g., failure detectors need timeouts to know when to send heartbeat messages1). b) Timeliness: we’d like our regression test to complete within a reasonable amount of time. Yet if we implement it naïvely, the regression test will have to sleep() for a long time to ensure that all events have completed. c) Engineering effort: depending on where we choose to interpose, we might need to expend large amounts of effort to ensure that our executions are sufficiently deterministic. d) Limited shelf-life: if we record interposition events at fine granularity, the regression test is likely to break as soon as we make small changes to the system (since the API calls invoked by the system will differ). Ideally we would like our regression tests to remain valid even as we make substantial changes to the system under test. Deterministic replay assumes that you are able to record an execution that leads up to the bug. To replay that execution, these tools wait for the application to make the same sequence of syscalls as the original execution, and return the same syscall values that were originally returned by the OS. Since the application must go through the syscall layer to interact with the outside world (including, for example, to read the current time), we are guaranteed determinism. That said, one major issue with using deterministic replay for regression testing is that the execution recording has limited shelf-life (since syscall recordings are very fine-grained). Another point in the design space is application-specific interposition, where we interpose on a narrow, high level API such as the RPC layer. We aren’t guaranteed determinism here, but we can achieve decent reliability with a judicious choice of interposition locations. One major advantage of application-specific interposition is reduced recording overhead: since we’re interposing on a high level API, we might be able to turn on execution recording in production to avoid needing to reproduce bugs in a test environment. Another advantage is extended shelf-life: we’re interposing on coarse, high level events, and we also have access to application semantics that help us recognize extraneous changes to the application’s behavior (e.g., we can know that cookies or sequence numbers should be ignored when deciding whether a message from the recorded execution is logically equivalent to a message in a replay execution). Finally, on the other extreme of the design space, we can just replay multiple times without any interposition and hope that the bug-triggering event interleaving shows up at least once.15 This requires minimal engineering effort and has unbounded shelf-life, but it may be unable to consistently reproduce the buggy execution. We’re given: (i) an assertion that we know the system has violated in the past, usually statistical in nature, about how long requests should take to be processed by the system, and (ii) a description of the system’s workload at the time the latency problem was detected. Our goal: we want to produce an oracle that will notify us whenever request latency gets notably worse as we make new changes to the system. a) Flakiness: Performance characteristics typically exhibit large variance. Despite variance, we need our assertion to avoid reporting too many false positives. Conversely, we need to prevent the assertion from missing too many true positives. b) Workload characterization: it can be difficult to reproduce production traffic mixes in a test environment. Regardless of whether your system is distributed or located on a single machine, request latency is defined by the time it takes to execute the program’s control flow for that request. In a system where concurrent tasks process a single request, it is useful to consider the critical path: the longest chain of dependent tasks starting with the request’s arrival, and ending with completion of the control flow. c) Limited Visibility: the control flow for a single request can touch thousands of machines, any one of which might be the source of a latency problem.16 So, we need to aggregate timing information across machines. Simple aggregation of statistics often isn’t sufficient though, since a single machine doesn’t have a way of knowing which local tasks were triggered by which incoming request. d) Instrumentation Overhead: It’s possible that the act of measuring execution times can itself significantly perturb the execution time, leading to false positives or false negatives. e) Intrusiveness: if we’re using our production deployment to find performance problems, we need to avoid increasing latency too much for clients. The main technique for addressing these challenges is distributed tracing. The core idea is simple:17 have the first machine assign an ID to the incoming request, and attach that ID (plus a pointer to the parent task) to all messages that are generated in response to the incoming request. Then have each downstream task that is involved in processing those messages log timing information associated with the request ID to disk. Propagating the ID across all machines results in a tree of timing information, where each vertex contains timing information for a single task (the ingress being the root), and each edge represents a control flow dependency between tasks. This timing information can be retrieved asynchronously from each machine. To minimize instrumentation overhead and intrusiveness, we can sample: only attach an ID to a fraction of incoming requests. 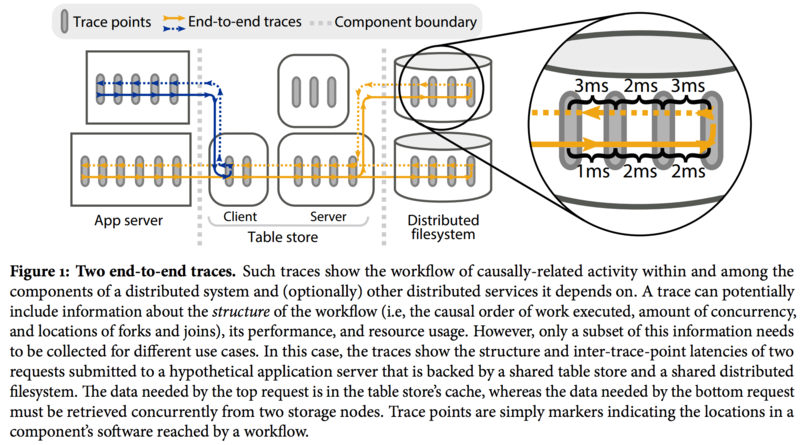 As long as overhead is low enough, we could overcome the challenge of workload characterization by running causal tracing on our production deployment. Distributed tracing does require a fair amount of engineering effort: we need to modify our system to attach and propagate IDs (it’s unfortunately non-trivial to ‘bolt-on’ a tracing system like Zipkin). Perhaps the simplest form of performance regression testing we can do is to analyze performance statistics without correlating across machines. We can still get end-to-end latency numbers by instrumenting clients, or by ensuring that the machine processing the incoming request is the same as the machine sending an acknowledgment to the client. The key issue then is figuring out the source of latency once we have detected a problem. a) Runtime overhead: It’s crucial that our instrumentation doesn’t incur noticeable latency costs for users. b) Possible privacy concerns: In some cases, our monitoring data will contain sensitive user information. c) Limited visibility: We can’t just stop the world to collect our monitoring data, and no single machine has global visibility into the state of the overall system. d) Failures in the monitoring system: The monitoring system is itself a distributed system that needs to deal with faults gracefully. An old idea is particularly useful here: distributed snapshots.27 Distributed snapshots are defined by consistent cuts: a subset of the events in the system’s execution such if any event e is contained in the subset, all ‘happens-before’ predecessors of e are also contained in the subset. Distributed snapshots allow us to obtain a global view of the state of all machines in the system, without needing to stop the world. Once we have a distributed snapshot in hand, we can check assertions about the state of the overall system (either offline28 or online29). That’s It For Now; More to Come! If you’d like to add anything I missed or correct topics I’ve mischaracterized, please feel free to issue a pull request!